Halloween can be the most exciting time of the year for some kids. They can be anything they want for a day — as long as you’re capable of making it happen. 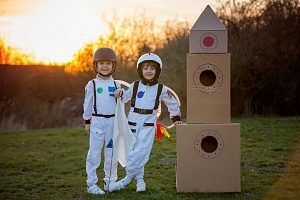 Store-bought costumes can be overpriced and made of cheap materials, while DIY ensembles can sometimes take more time and money than you’d like. Fun and creative doesn’t have to cost you extra money or stress, though. 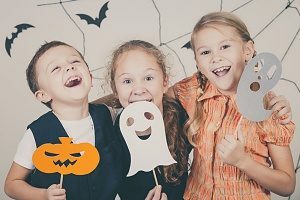 Here are six costumes that you can make yourself to give your child a Halloween costume that stands out. The best part of this amazingly simple octopus costume isn’t that it’ll only take you about an hour to make — it’s that the whole thing can come apart to transform into wearable clothes that your child can use long after Halloween is over. Just stuff three pairs of matching, footed tights with cotton batting, then wrap them around a belt and pin with safety pins. Your child can wear a fourth pair of matching tights to create the last of the legs. Top it all off with a coordinating shirt and knit hat decorated with felt eyes, and you have a wonderfully silly sea creature on your hands. Siblings can get in on the underwater fun by dressing up as a scuba diver. Just spray paint a pair of two-liter soda bottles and decorate with black and silver tape to resemble oxygen tanks, add some straps and a scuba mask, and layer it all over an all-black outfit. A little weather person with a rain cloud following them is cute enough that no one will mind the drizzle. Hot glue bunches of cotton batting onto an old umbrella to make the cloud. Cut out drops of water from blue paper, then attach to transparent fishing line or thin ribbons and hot glue them to the inside of the umbrella. For a punny take, replace the raindrops with pictures of cats and dogs to make it “rain cats and dogs” instead. Your child can wear their usual rain gear and carry around the umbrella over their head for a comfy, affordable outfit. Turn your child’s love for soccer, hockey, baseball, and more into a trophy costume worthy of recognition. This outfit is the perfect way to give old practice gear a last hurrah before it’s retired. Simply spray paint the gear — a shirt, shoes, socks, sneakers, and ball or other equipment, like an old lacrosse stick — with gold fabric spray paint. Be sure to spray outdoors or in a well-ventilated area and use newspaper underneath to prevent stains. When it’s dry, your golden child can put it all on and strike a pose to complete their winning look. The gold paint tends to show up best on plain, white clothing, so consider choosing light colored clothing or buying some inexpensive or secondhand components for this one. Your baby girl or boy already looks like a little doll — why not complete the effect with a wind up key? This costume is great for kids of all ages, especially if your little one doesn’t mind the new attachment. The wind up key can be made from a spray painted toilet paper roll topped with a styrofoam ball and a curly cutout to make the top of the key. Elastic straps that match the color of the outfit worn under can be easily glued to the bottom of the roll and looped around their arms. For girls, a frilly dress and giant bow on top can finish the look. For boys, consider a toy soldier theme with black pants, a red shirt, and tin foil buttons and shoulder decorations. Don’t forget the classic rosy cheeks! You can paint on some red circles with face paint, cream blush, or even lipstick — just make sure your child knows not to touch! Who says candy should be the only sweet treat on Halloween? A donut can easily be made out of an inflated pool tube and some spray paint in your favorite frosting color. Then, spray paint some foam hair rollers in bright colors and attach them with a hot glue gun on a low setting to create the sprinkles. Straps can be attached to go over the arms or across the body, whichever is more comfortable for your child. To complete the sweet effect, your child can dress in light, sherbert colors like blue and orange, though plain jeans and a T-shirt can work just as well in a pinch. A full space suit can be tricky to put together, but a more casual coveralls look is still classic astronaut without the hassle of figuring out how to make a helmet. Just add iron-on patches with a flag, a NASA logo, and planets or space ships to navy blue coveralls, and your child is ready to take off. This outfit is particularly great for babies, as you can turn a dark-colored onesie into a comfy costume that doesn’t require any extra accessories to bother them. If you can’t find coveralls in the right size, consider regular overalls layered over a dark shirt and patch away.